Nestled on Europe’s Iberian Peninsula, Spain is a laid-back country that is devoted to living the good life. The capital city of Madrid is home to the Prado museum and the magnificent Royal Palace. Catalonia’s capital, Barcelona boasts Antoni Gaudí’s whimsical modernist landmarks like the Sagrada Família church. Charming, warm and welcoming, Spain is fun place to visit. Set between Marbella and Puerto Banús, the Marbella Club Hotel Golf Resort & Spa is a luxurious beachfront hotel surrounded by lush gardens with direct beach access and deluxe amenities. The opulent retreat features beautifully appointed guest rooms and suites with plush décor, marble en-suite bathrooms with rainfall showers, private terraces with garden or sea views, and luxe conveniences such as air-conditioning, flat-screen satellite televisions, and wireless Internet access. High-end villas offer multiple bedrooms, fully equipped kitchens, and private swimming pools. An exclusive spa has 12 treatment rooms and provides indulgent massages and holistic therapies, while other facilities include two swimming pools, five award-winning restaurants and bars, a spectacular botanical garden and a state-of-the-art gym. 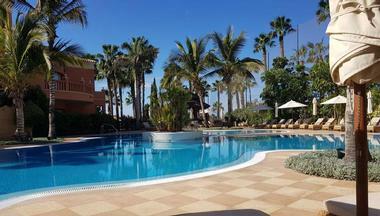 The Marbella Club Hotel Golf Resort & Spa is a short drive from the Puerto Banús shopping area. 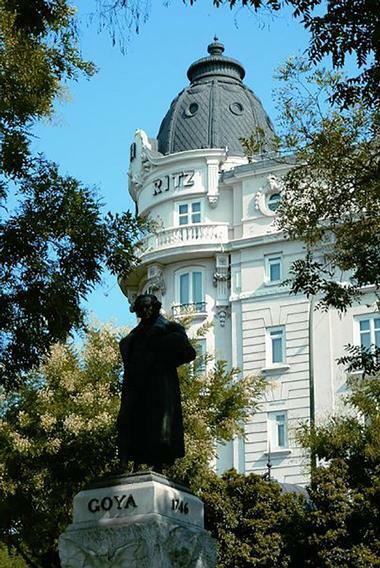 Located opposite San Sebastian’s Victoria Eugenia Theatre with breathtaking the Urumea River and the Cantabrian Sea, the Hotel Maria Cristina, A Luxury Collection Hotel is a luxurious belle epoque hotel that offers an unforgettable stay. Dating back to 1912, the grand hotel features lavish guest rooms and suites with stylish living spaces, plush décor, marble en-suite bathrooms with rain showers, bathrobe, slippers, and designer toiletries. Luxe conveniences include as air-conditioning, flat-screen satellite televisions, minibars, Bang & Olufsen sound systems, and complimentary wireless Internet access. Private terraces boast stunning views, and a posh Asian restaurant and a sophisticated bar serve sublime cuisine and cocktails. Other facilities include a culinary school and a 24-hour gym, and the hotel is a short walk away from the Gros train station and the city center. 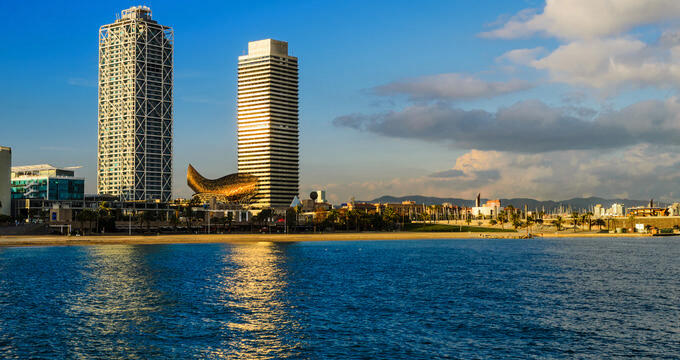 Overlooking Barceloneta Beach and Barcelona city center in a modern high rise building next to Barcelona’s Olympic Port, the Hotel Arts Barcelona features contemporary guest rooms and suites, an exclusive spa, two outdoor swimming pools, and five highly acclaimed restaurants. Fronted by the iconic Peix fish sculpture, the luxe hotel boasts designer accommodations with marble en-suite bathrooms with rain showers, and designer toiletries, and modern amenities such as air-conditioning, flat-screen satellite televisions, and wireless Internet access. Breakfast is served every morning and five restaurants, one of which has two Michelin stars, serve a selection of globally-inspired cuisine and libations. 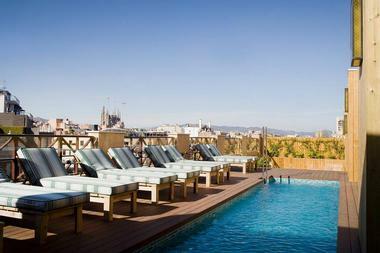 Hotel Arts Barcelona is within walking distance of the world-renowned Sagrada Família and lively Plaça de Catalunya. Overlooking the Plaza del Castillo in the heart of Pamplona, the Gran Hotel La Perla is a stately, upscale 19th-century hotel that seamlessly blends stylish classic décor with modern amenities. Elegantly appointed sound-proofed rooms have wooden floors, spacious sitting areas, marble en-suite bathrooms with soaking tubs, rainfall showers, and luxe toiletries. Modern amenities include air-conditioning, flat-screen satellite televisions, and wireless Internet access, and suites have balconies with beautiful views over the square. Gran Hotel La Perla's traditional restaurant has a charming patio and serves breakfast every morning, and a relaxed bar offers a variety of libations in the evenings. Other amenities include a beautiful library with a piano and a business center. 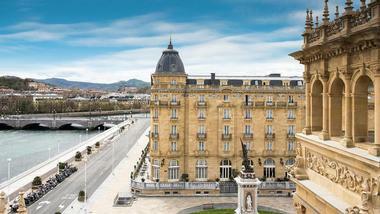 The Gran Hotel La Perla is close to the Pamplona Cathedral and the Plaza del Castillo’s bullring. 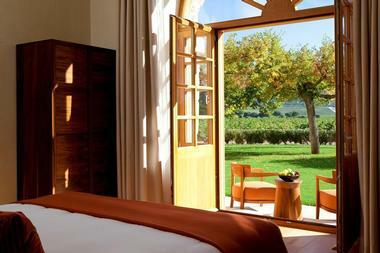 Set on a sprawling sun-kissed wine estate with a 12th-century abbey in Sardoncillo, Hotel Abadia Retuerta LeDomaine is a luxurious countryside retreat on the banks of the Douro River. The beautifully appointed hotel features plush, country-style rooms with custom-made wooden furnishings, mood lighting, en-suite bathrooms with soaking tubs, luxe toiletries, and modern amenities such as air-conditioning, flat-screen satellite televisions, iPod docking stations, minibars, and wireless Internet access. Other high-end facilities include a gourmet dining restaurant with a vaulted ceiling and an acclaimed wine cellar, an exclusive day spa with a hot tub and a sauna, a swimming pool, and fully-equipped gym. Hotel Abadia Retuerta LeDomaine is a short drive from the quaint village of Sardón de Duero and guests can enjoy hiking and biking around the area. Established in 1919, El Palace Barcelona is a beautiful hotel with a neo-classical façade in the Eixample District, close to bustling shopping and tourist destination of La Ramblas. The elegant, upscale hotel features ornate guest rooms and suites with decorative fireplaces, spacious living areas, en-suite bathrooms with whirlpool tubs, luxe toiletries, and modern amenities such as air-conditioning, flat-screen satellite televisions, minibars, and wireless Internet access. A charming rooftop garden has an outdoor swimming pool, and two restaurants and bars serves traditional Spanish and Mediterranean cuisine and signature cocktails. Other deluxe amenities include an exclusive Mayan-style luxury spa, a fully equipped exercise room, a business center, and a private chauffeur service on request. El Palace Barcelona is within walking distance of Museu Picasso, Gaudí’s Casa Batlló and La Pedrera, and the Urquinaona Metro station. 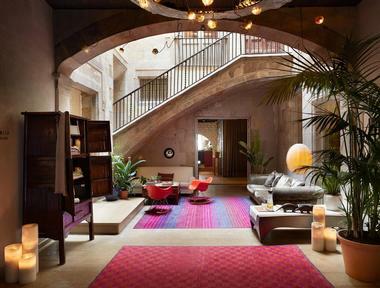 Set on Plaza de Obradoiro in a beautiful 15th-century building next to Santiago’s famous cathedral that was once lodging for pilgrims, Parador Santiago de Compostela Hotel Spain - Hostal Reis Catolicos is a luxurious hotel with original vaulted ceilings, stone archways, and tapestries. The hotel features elegant old-world guest rooms and suites with classic décor, antique furnishings, four-poster beds in luxury linens, en-suite bathrooms with rainfall showers and luxe toiletries, and modern amenities such as air-conditioning, flat-screen satellite televisions, minibars, and wireless Internet access. Two upmarket restaurants serve traditional Galician fare, and a coffee and cocktail bar offers freshly brewed coffee and cocktails. 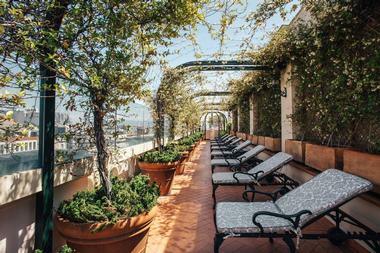 The hotel also boasts four beautiful cloister gardens, a terrace with stunning cathedral views, and a relaxed lounge. Parador Santiago de Compostela Hotel Spain - Hostal Reis Catolicos is right in the heart of Santiago de Compostela’s picturesque old town. 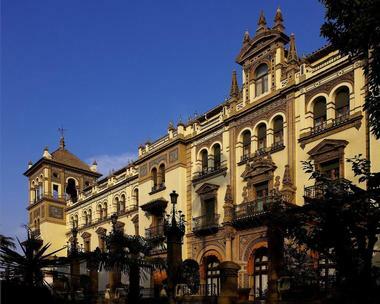 One of Spain's most prestigious hotels, the Hotel Alfonso XIII - A Luxury Collection Hotel is an ornate hotel located next to Seville’s Real Alcazares with lavish accommodations and world-class facilities. Boasting a beautiful Moroccan design with Arabic-style arches and ceramic tiles, the hotel features individually decorated guest rooms and suites with marble and Sevillian-tiled en-suite bathrooms, and modern conveniences such as air-conditioning, flat-screen satellite televisions, minibars, and wireless Internet access. 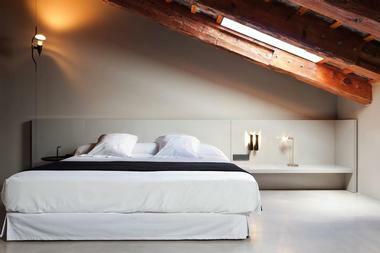 Juliet balconies or private terraces boast breathtaking views, and in-room massages and room service are available. Upscale facilities include an outdoor swimming pool, a fully-equipped fitness center, a manicured garden courtyard with a fountain, and two restaurants and bars, which serve traditional and Andalusian cuisine. Hotel Alfonso XIII - A Luxury Collection Hotel is a short walk away from the historic Santa Cruz district, the Seville Cathedral and the Giralda, and the Torre de Oro. Set in a beautiful 19th-century manor house overlooking Plaza de Sant Francesc in the old town of Palma de Mallorca, the five-star Sant Francesc Hotel Singular is a refined retreat with deluxe accommodations and stylish amenities. Situated a short stroll from the Catedral de Mallorca and the Balearic Sea, the hotel features airy guest rooms and suites with courtyard or garden views, wood-beamed ceilings, and covered verandas, en-suite bathrooms, and modern conveniences such as air-conditioning, flat-screen satellite televisions, minibars, Nespresso machines, and wireless Internet access. A rooftop terrace has a sushi bar and swimming with a sundeck and panoramic city views, and traditional Spanish cuisine can be enjoyed at the hotel’s elegant restaurant and bar with a courtyard patio. Other deluxe amenities include an exclusive spa, a fully equipped fitness center, and a beautiful garden. 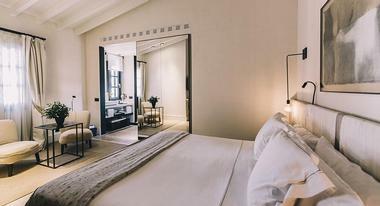 Housed in a 19th-century neoclassical landmark building close to Barcelona’s bustling Plaza Catalunya, the Cotton House Hotel, Autograph Collection, A Marriott Luxury & Lifestyle Hotel offers elegant guest rooms and suites with modern conveniences and world-class facilities. Surrounded by beautiful old buildings, the hotel has a gorgeous rooftop pool with a furnished sundeck and an upscale Mediterranean restaurant with a bar where guests can dine alfresco-style on the terrace against a backdrop of city views. Well-appointed, individually decorated guest rooms and suites have vaulted ceilings, four-poster beds in refined linens, marble en-suite bathrooms with walk-in showers, and modern conveniences such as air-conditioning, flat-screen satellite televisions, minibars, Nespresso machines, and wireless Internet access. The former headquarters of the Association of Cotton House Manufacturers building also a beautiful vestibule, several elegant lounges, a fully-stocked library, and a conservatory. The Seaside Grand Hotel Residencia is a luxury, Spanish Colonial-style hotel surrounded by lush tropical gardens Gran Canaria’s Maspalomas Dunes. The hotel complex features beautifully appointed accommodations designed by Alberto Pinto in the form of deluxe villas with spacious living areas, en-suite bathrooms with whirlpool tubs, rain showers, and luxe toiletries, and modern amenities such as air-conditioning, flat-screen satellite televisions, iPod docking stations, minibars, espresso machines, and wireless Internet access. Private balconies or terraces boast gorgeous views of the garden, and high-end facilities include an exclusive spa and wellness center with a hydro-massage saltwater pool, sauna and Turkish bath; a heated outdoor swimming pool, and an acclaimed restaurant serving Canarian and international cuisine. The complex also has a poolside snack bar and a piano bar and an expansive terrace on which guests can dine alfresco style. The Seaside Grand Hotel Residencia is a short drive from the Meloneras Golf Course and guests can play tennis or enjoy tai-chi or aqua aerobics classes at the neighboring Seaside Palm Beach. The Vincci Selección Aleysa Hotel Boutique & Spa is a stunning beachfront boutique hotel with beautiful views over the Mediterranean Sea. Offering direct access to Benalmádena's Las Gaviotas Beach, the chic, seaside spa hotel features an elegant sea-view restaurant and a bar that serves traditional and regional cuisine, an exclusive spa with an indoor swimming pool, treatments rooms and a sauna, and an outdoor swimming pool with views. Well-appointed guest rooms and suites have sitting areas with pull-out sofas, en-suite bathrooms have bathrobes, slippers and deluxe toiletries, and modern amenities such as air-conditioning, flat-screen satellite televisions, CD and DVD players, minibars, coffee machines, and wireless Internet access. Vincci Selección Aleysa Hotel Boutique & Spa's restaurant serves globally-inspired cuisine and a snack bar, terrace and lounge-bar offer casual fare and drinks. Guest services include free yoga and Pilates classes, and courtesy cars upon request and the hotel is within walking distance of the Puerto Marina leisure port where a shopping center and several bars and clubs can be found. Situated in Madrid’s Chamberí District very close to the Alonso Martinez and Colón Metro Stations, the Hotel Orfila is an elegant hotel set in a 19th-century palace with a neoclassical façade, antique furnishings, and high-end facilities. The hotel offers spacious and individually decorated guest rooms and suites with en-suite bathrooms featuring bathrobes, slippers, and deluxe toiletries, whirlpool tubs, living areas and balconies with scenic views. Modern amenities include air-conditioning, flat-screen satellite televisions, sound systems, minibars, coffee machines, and wireless Internet access. The hotel’s restaurant El Jardin de Orfila is helmed by the Michelin-star Chef Mario Sandoval and serves a range of regional and Mediterranean cuisine, and a traditional tea room offers a high tea on the terrace overlooking the gardens. 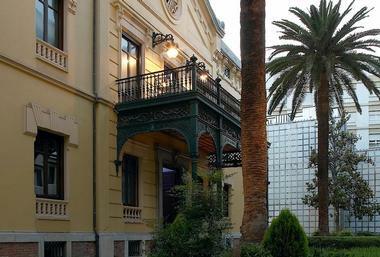 The hotel is a short walk away from the National Archaeological Museum of Spain. 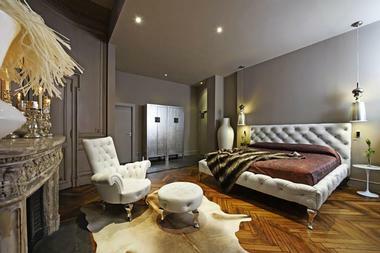 Housed in a 19th-century palace in the Seu-Xerea district in the heart of Valencia, the chic Caro Hotel combines historical features with modern design, designer guest accommodations and world-class facilities to provide a unique retreat. Designed by Francesc Rifé, individually decorated guest rooms and suites have touches of minimalist design and feature en-suite bathrooms with rain showers, bathrobes, slippers and Bulgari toiletries, spacious living areas with stone walls and fireplaces, and modern amenities such as air-conditioning, flat-screen satellite televisions, sound systems, minibars, coffee machines, and wireless Internet access. Private balconies or terraces boast beautiful views, and a sleek Michelin-star restaurant and bar serves award-winning regional cuisine in an elegant setting. Facilities include an outdoor swimming pool, and the hotel is within walking distance of the Valencia Cathedral, the medieval market and a UNESCO World Heritage Site of La Lonja de la Seda, and Plaza de la Virgen. Located in Madrid’s ‘Golden Triangle’ of culture in the heart of the city, the Hotel Ritz is a magnificent belle époque palace and five-star luxury hotel that dates back to the early 1900s. Built in 1920, the façade is a listed national monument and is surrounded by beautiful gardens and a tranquil terrace in which guests can escape the hustle and bustle of the city. The grand hotel features exquisitely appointed guest rooms and suites with classic décor, modern amenities and spectacular views of the city, an ornate restaurant serves highly acclaimed, innovative Spanish cuisine, and an elegant hall offers a traditional high tea. 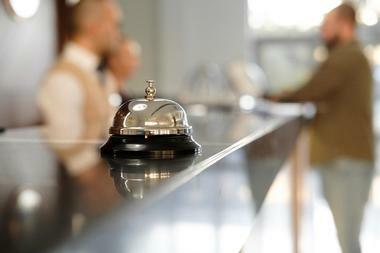 Other facilities include an exclusive day spa, a fully equipped fitness center, and luxe caviar bar. Located directly opposite the Museo del Prado and within walking distance of Madrid’s leading museums and galleries, the Hotel Ritz is the perfect base for discerning guests wanting to soak up the rich culture of Madrid. Based in a beautiful neoclassical building on Passeig de Gràcia, the Majestic Hotel & Spa Barcelona GL is a stately hotel with luxurious accommodations, an exclusive spa and rooftop swimming pool, and spectacular views of the city. Situated a short walk away from the world-renowned Sagrada Familia, the luxe hotel offers elegant guest rooms and suites with attractive, classic décor, en-suite bathrooms with whirlpool tubs and deluxe toiletries, and modern amenities such as air-conditioning, flat-screen satellite televisions, sound systems, minibars, coffee machines, and wireless Internet access. Spacious private apartments are located at an independent building next to the hotel, and a deluxe penthouse suite offers complimentary beach transfers and scooter rentals. The hotel features three highly acclaimed restaurants and bars with a sleek terrace bar overlooking the city, as well as an outdoor swimming pool, an exclusive spa, and fitness center and an elegant piano bar with live music in the evenings. The Majestic Hotel & Spa Barcelona GL is within walking distance of Gaudí’s Casa Batlló, Plaza de Catalunya and the bustling tourist attraction of Las Ramblas. 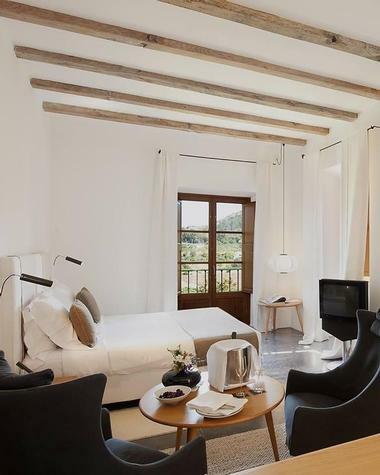 Set in a magnificent 17th-century mansion overlooking the Puigpunyent Valley and Tramuntana mountains, the Gran Hotel Son Net is an elegant and refined hotel with parts that date back to 1672. The exquisitely appointed retreat features formal guest rooms and suites with warm décor, antique furnishings, marble en-suite bathrooms with soaking tubs and deluxe toiletries, and modern amenities such as air-conditioning, flat-screen satellite televisions, minibars, coffee machines, and wireless Internet access. Secluded stone cottages have spacious living and dining areas, four-poster beds and private terraces with spectacular valley views, and all accommodations have access to the hotel’s gorgeous gardens. Two fine dining restaurants serve award-winning cuisine, and a sleek bar serves fine wines from around the world and signature cocktails, and other facilities include an outdoor swimming pool, a fully equipped fitness center and a beauty center offering a selection of relaxing treatments and massages. Set within the Golf Las Américas golf course in South Tenerife, the Hotel Las Madrigueras Golf Resort & Spa - Adults Only boasts a spectacular setting with an exclusive spa and wellness center with a Turkish bath and a stunning outdoor swimming pool. Embracing breathtaking views of the golf course, Atlantic Ocean and La Gomera Island, the hotel features deluxe guest rooms and suites with parquet floors and elegant furnishings, marble en-suite bathrooms, soaking tubs and designer toiletries, and modern amenities such as air-conditioning, flat-screen satellite televisions, minibars, coffee machines, and wireless Internet access. Private balconies and terraces have lovely vistas, and free golf buggies are included with all rooms. A complimentary buffet breakfast is served in a rooftop restaurant overlooking the course, and there is an elegant piano bar, a billiards lounge, and a casual eatery with a terrace for candlelit dinners. Located in the heart of Seville, the Gran Meliá Colón is a design hotel with a striking lobby with a Modernist dome and within walking distance of the Giralda Tower and Seville Cathedral, the Alcazar Palace, and the Plaza de Armas Square. The contemporary hotel features modern guest rooms and suites with en-suite bathrooms, rainfall showers, and deluxe Clarins toiletries, along with in-room conveniences such as air-conditioning, automatic lighting, flat-screen satellite televisions, minibars, coffee machines, and wireless Internet access. Upscale facilities include a gourmet Andalusian restaurant serving regional cuisine and a terrace with boutique rooftop swimming pool and spectacular city views. Other facilities available include an exclusive day spa by Clarins, which offers a sauna, Turkish hammam, and bitegmic shower, a fully equipped fitness center, a casual café, and a chic cocktail lounge. Hotel Neri Relais & Châteaux is a chic, exclusive hotel set in an 18th-century aristocratic house with an impressive façade overlooking the secluded Sant Felip Neri square in the heart of the Gothic Quarter. Set right beside the city’s Cathedral and seamlessly blending the building’s original period charm with contemporary style and sophisticated interior design, the luxurious hotel features a 17th-century stone wall, which separates the lounge bar area of the restaurant and has the status of Specialty Monument. Understated guest rooms and suites have spacious living areas, en-suite bathrooms with deluxe toiletries, balconies or terraces with beautiful views and modern amenities such as air-conditioning, flat-screen satellite televisions, minibars, coffee machines, and wireless Internet access. A rustic gourmet restaurant serves regional cuisine, and an intimate rooftop garden terrace offers casual fare and a variety of libations. 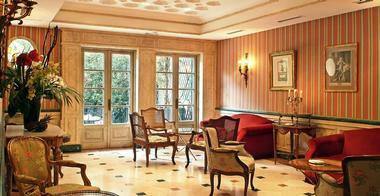 Hotel Neri Relais & Châteaux is a short walk away from Museu Picasso, and the Liceu metro station. 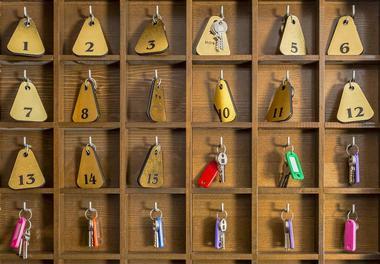 The Hotel Omm is a hip hotel in a contemporary building just a minute's walk from the Diagonal metro station that offers comfortable, modern rooms with stylish décor, an elegant acclaimed restaurant and casual eatery with a bar, and a chic nightclub. 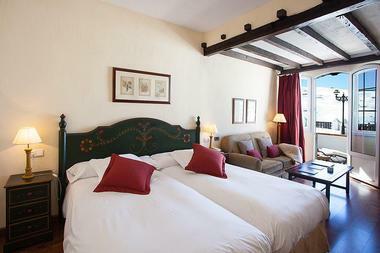 Ideally located within walking distance from the shops around Plaça de Catalunya, and Antonio Gaudi's La Sagrada Família, the hotel features airy guest rooms with oak parquet floors and hand-woven rugs, sitting areas and canopy beds, en-suite bathrooms, and modern amenities such as air-conditioning, flat-screen satellite televisions, minibars, and wireless Internet access. Other amenities include a seasonal rooftop terrace with spectacular city views, a swimming pool and a luxury day spa with an indoor pool and a Turkish hammam. Set in a beautifully restored former 19th-century palace just off Barcelona’s prestigious Passeig de Gràcia Boulevard, the Claris Hotel & Spa GL is a luxury hotel that combines the rich history of the building with contemporary features and boasts a unique collection of over 400 original pieces of art, giving it a Specialty Monument status. The hotel features smart, soundproofed guest rooms with stylish décor and custom-made furniture, en-suite bathrooms, and modern amenities such as air-conditioning, flat-screen satellite televisions, minibars, and wireless Internet access. An elegant restaurant offers traditional Mediterranean fare in a stylish setting on the roof terrace against a backdrop of panoramic views of the Eixample quarter, and the more casual Mr. Kao Restaurant offers classic Chinese cuisine. The Claris Hotel & Spa GL is within walking distance of Gaudí’s Casa Batlló and La Pedrera, and guests of the hotel enjoy free entry to the Barcelona Egyptian Museum, which is located next door. Set in a beautifully restored early 20th-century mansion with an ornate, redbrick façade in the center of Oviedo, the Barceló Oviedo Cervantes is an upmarket hotel with an award-winning design that seamlessly blends classic and contemporary elements. Located within walking distance of the Oviedo Cathedral and the pre-Romanesque Holy Chamber, the hotel features stylishly appointed guest rooms with sleek décor, en-suite bathrooms with hydromassage showers, and modern amenities such as air-conditioning, flat-screen satellite televisions, minibars, Nespresso machines, and wireless Internet access. A gourmet restaurant serves typical Asturian food and hosts show cooking, and a trendy, vibrant lounge is ideal for relaxing with cocktails. Occupying a beautifully restored 19th-century palace and a contrasting modern building, the Hospes Palacio de Los Patos is an upmarket hotel with elegant guest room and suites, an exclusive spa and wellness center, a fine dining restaurant serving healthy, regional cuisine, and a magnificent garden with Arabian-style fountains. 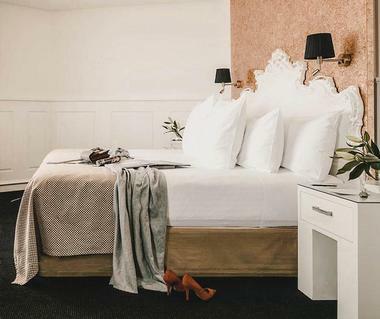 Individually decorated guest rooms have contemporary, en-suite bathrooms and modern amenities, such as air-conditioning, flat-screen satellite televisions, minibars, Nespresso machines, and wireless Internet access. The Asian-influenced spa features an indoor swimming pool, a sauna, and a traditional Turkish bath and offers an array of massages and beauty treatments, and a 24-hour reception provides concierge services. 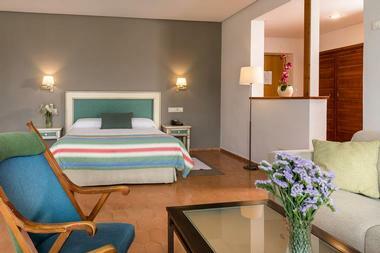 The Hospes Palacio de Los Patos is within walking distance of the Granada Cathedral and the Alhambra. 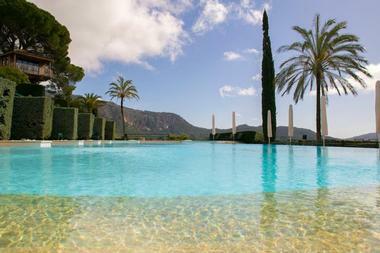 Set on 40 acres of rolling landscapes with olive groves and fruit trees near the Bay of Pollença in northern Mallorca, the Son Brull Hotel & Spa is a sophisticated hotel with contemporary accommodations, an outdoor swimming pool, an exclusive spa and wellness center and spectacular views of the surrounding mountains. 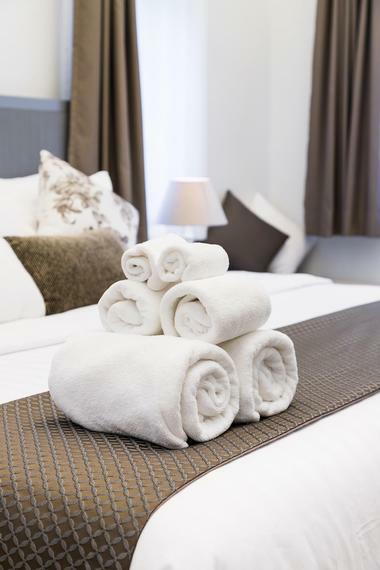 Well-appointed guest rooms have en-suite bathrooms and modern amenities such as air-conditioning, flat-screen satellite televisions, minibars, Nespresso machines, and wireless Internet access. The spa features a partially covered swimming pool, a fully equipped gym and a sauna, and an elegant restaurant with a terrace serves breakfast every morning and regional cuisine for dinner. The hotel also offers a tennis court and free bicycle rental and is a short drive away from La Casa Museu Dionís Bennàssar and Cala Sant Vicenç beach.